I am getting a little better about taking pictures of interesting family bikes we see around the city. Some of them are ridden by people we know, and some of them seem to be just passing through. There are now more manufacturers in the US focused on creating bicycles that work for families–Xtracycle (almost everything) and Surly (Big Dummy), Kona (Ute and MinUte) Yuba (Mundo, elMundo, maybe the as-yet-unrevealed Boda Boda), Metrofiets, KidzTandem–but it’s not a hugely developed market, especially as kids get older. So people often work out their own strategies, and they’re sometimes even more interesting. 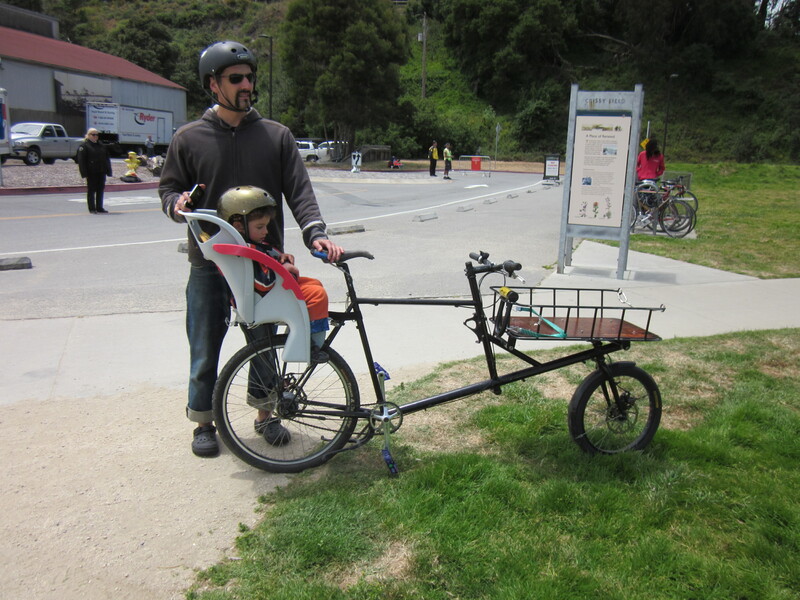 This isn’t the best photo, but this bike belongs to a family we know and is a tandem with a trailer-bike attached. The dad is a former mountain bike racer and we see them during member hours at the Academy of Sciences sometimes. Matt caught this picture of one of their many bikes during a party at a mutual friend’s house in the Presidio, although he didn’t see them riding it. 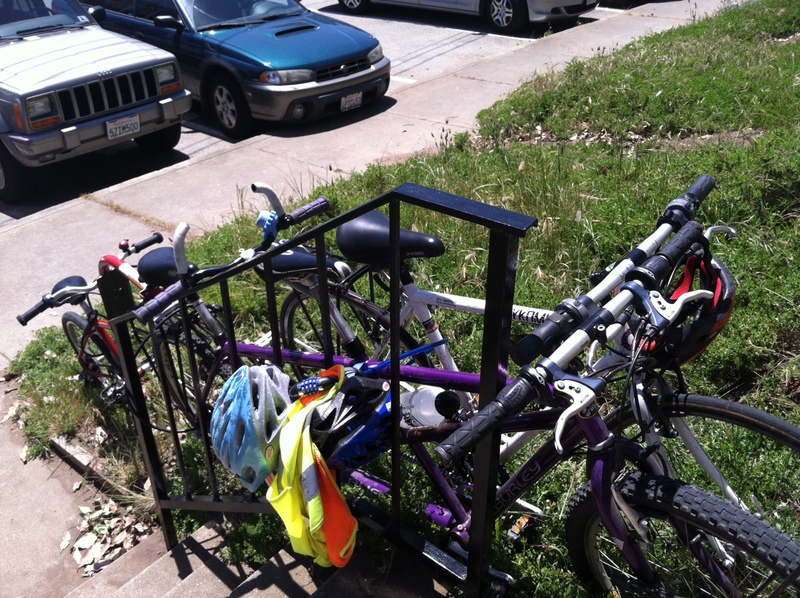 I think these two recumbent bicycle pirates were just passing through, because I’ve never seen them before or since. 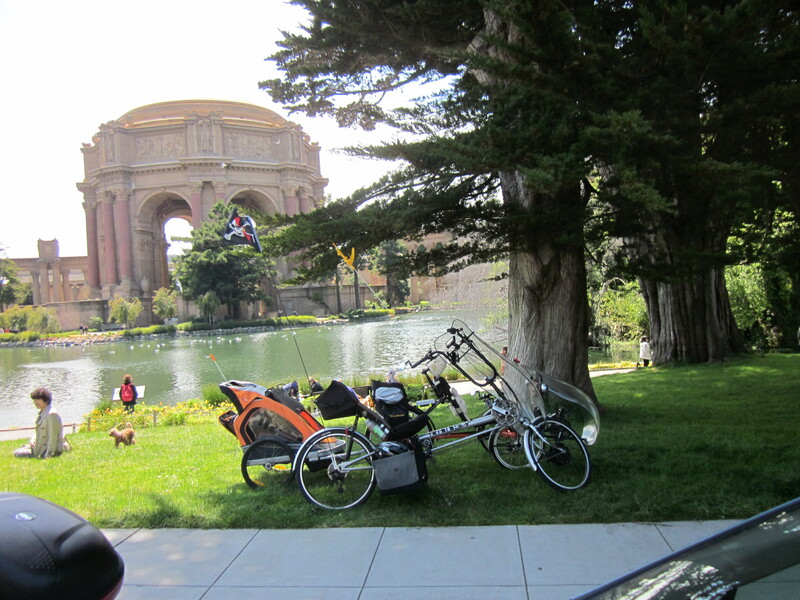 But these recumbents had a kid trailer (there was a small helmet inside and stuffed animals), and both bikes had an electric assist; one in the front hub and one in the rear hub. I didn’t find the riders but would have liked to ask them the difference. They had very large battery packs which supports my suspicion that they were only visiting San Francisco. Also they were recumbent bicycles, and I’ve never met anyone who liked riding those in city traffic. Yay, tail pipe exhaust. Woo hoo, unlikely to be seen by drivers. Last but not least is the custom Bilenky I spotted at the Golden Gate Bridge anniversary party, with a child seat added to the rear rack. The dad who was riding it said he had gotten it before he was a parent, but with that much cargo space it seems reasonable enough to squeeze a child seat on somewhere. I have seen pictures of cargo bikes (and cargo scooters) with kids on the front deck, but his son was young and a rear seat is probably safer at that age. I have a lead on another wild family bike, but no photos yet: to be continued, I hope.